Discover a world of published academic research with Idea Store and Access to Research . Over 1.5 million academic articles are available through a unique collaboration between librarians and publishers, who have made their journal content available free of charge. 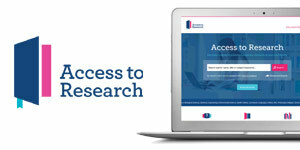 Please note, that the Access to Research service is only accessible via the Idea Store public PCs, through the image and web links on this page. What academic articles are included? Visit the Browse all journals page, to see what is included. With a backlog of publishers waiting to join the service, the number of articles available is set to increase with new titles frequently added. Which publishers are taking part in the scheme? The initiative is supported by the leading UK academic publishers, with more publishers signed up to join. For further information about the Access to Research scheme visit the their Frequently Asked Questions web page or view the Access to Research FAQ Flyer [PDF].